Use the Workflow Validation tool in vCO! – January 13, 2012Posted in: Best-Practices, Get Started! We had to follow that principle while trying to let LEDs blink (I miss a vCO-Plugin for MPC555 :-D) , but I still remember my Prof.’s words when I develop workflows. 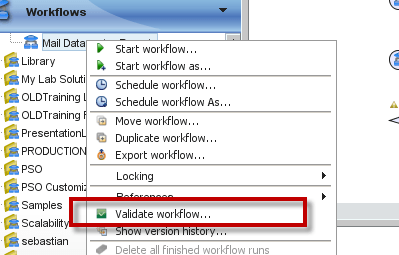 You can run the validation by pressing the “Validate”-Button in the Workflow editor, or in the context menu of a workflow in the workflowlList. Errors are hard formal violations which prevent the workflow from running sucessful. Warnings are “soft” violations: Your workflow can be started, but it likely has some bugs. For some of the validation results “Quick Fix actions” are recommended. They might fix the issue, but do not trust them blindly! When you ran the validation at least once, errors and warnings are also shown as small red or yellow symbols directly at the related workflow element in the schema. This is very helpful for larger workflows! You can change this behavior in the menue “Tools / User Preferences… ” of the vCO client, there in the “Workflows”-section (the checkbox is labeled with “Validate workflow before running it”). I recommend to only do this in your development environment, when you want to start workflows with errors (e.g. while they’re not developed completely yet)! A valid workflow is not necessarily error-free! In very rare caes you also might get some false positives in the validation results. The only situation I remember is, when you need a workflow attribute only for input presentation processing, but not in the workflow: You’ll get a “Attribute XYZ is never used!” warning (, and the quick-fix would delete it and break the processing of input presentation!). In sum: Always end up with a workflow that shows “0 Warnings, 0 Errors“! On Validation, you MUST always strive for “0 Errors”. In reality, Warnings are okay and even to be expected in MANY cases. Case in point would be having an Attribute with an array of strings that is ONLY used in the Presentation tab of your workflow. This attribute would provide a default set of values for that particular input. Since the attribute is not an input or output of any of your workflow elements, it will generate a Warning stating it is not used, when it really is!!! … So, be careful when taking quick fix actions on Warning items as they may cause you to lose some functionality in the presentation of your workflow. Thanks for your reply: So true! BTW: This also brings up the discussion if (and how much) you should put some business logic in workflow presentation..